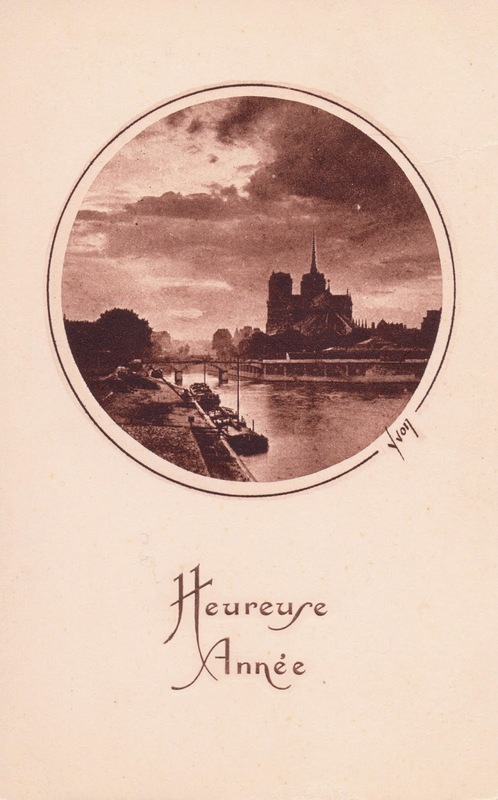 A lovely, if somewhat dark, 1928 carte de voeux that I found at the Marché aux timbres in Paris. Bonne année cards haven't always been images of popping champagne corks, fireworks, and glittery Eiffel Towers, I guess. This one is just serene. And on the flip side, a sweet and somewhat traditional message returning good wishes for the year. I think that in France one normally doesn't wish Happy New Year until after the stroke of midnight. After that, you can wish Bonne Année for the entire month of January. I like that. Anyway, here is the message side. Je vous remercie bien vivement de vos souhaits qui m'ont fait le plus grand plaisir. 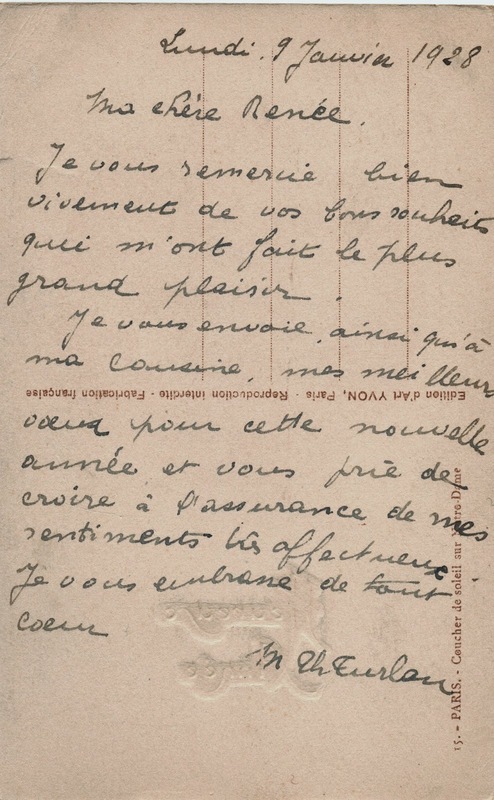 Je vous envoie, ainsi qu'à ma cousine, mes meilleurs voeux pour cette nouvelle année et vous prie de croire à l'assurance de mes sentiments très affectueux. Je vous embrasse de tout coeur." Thank you so much for your good wishes, which made me so happy. I send to you, and to my cousin, my best wishes for this new year, and beg you to believe in the assurance of my very affectionate sentiments. I send kisses with all my heart." And so, mes amis, I beg you to believe in the assurance of my warmest wishes for a happy and healthy 2015. How to celebrate New Year's in France? Here are mouth-watering and intriguing suggestions ...from 60 years ago. 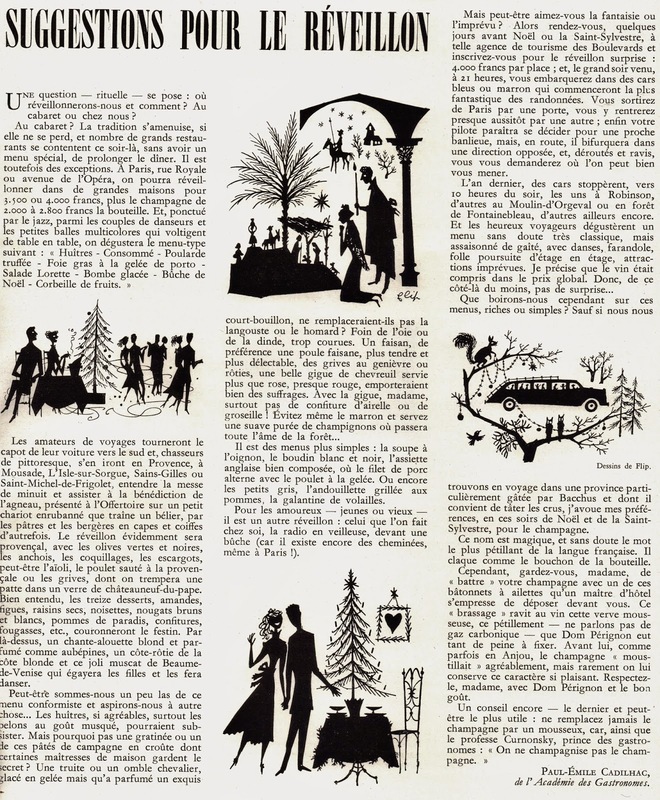 The 1954 December issue of Plaisir de France had the following delightful column, "Suggestions Pour le Réveillon." Scroll down for the translation by yours truly. Le réveillon, by the way, is the late-evening festive meal that is traditional for both Christmas Eve and New Year's eve. 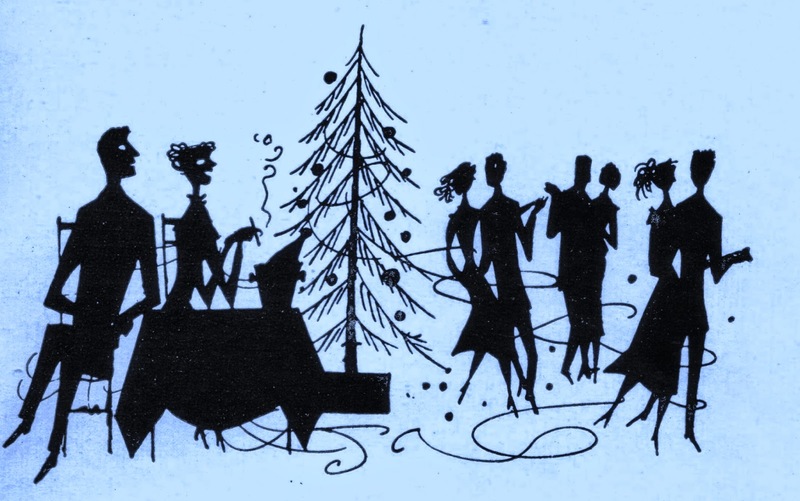 "Ah, the perennial question – a ritual, really: where and how will we spend New Year’s Eve? Out at a cabaret or at home? Those who like to travel might head south in their cars and, seeking out the picturesque, can head to Provence – to Mousade, L’Isle sur la Sorgue, Sains-Gilles or Saint-Michel-de-Frigolet, listen to midnight mass and attend the benediction of the lamb, presented at the Offertory on a little beribboned cart pulled by a ram, with the shepherds and shepherdesses in old-fashioned attire and head dress. The réveillon dinner will be provençal, of course, with green and black olives, anchovies, scallops, snails, maybe some aioli, sautéed chicken a la provençale or wild thrush, which you will dip the leg of in a glass of Chateauneuf-du-pape. Of course, the 13 desserts – almonds, figs, raisins, hazelnuts, brown and white nougats, pommes de paradis, jams, fougasses, etc., will complete the festivities. To top it off, wines might include a white Chante-alouette and the lovely muscat de Beaume-de-Venise which will make the girls lively and cause them to dance. Or perhaps we are somewhat tired of the conformist menu and we aspire to something else. Oysters, so enjoyable, and especially belons with their musky flavor, are a nice substitute. By why not a gratinée or one of these wonderful pâtés de campagne en croûte, for which the lady of the household surely has a secret recipe? Or perhaps a trout or Arctic char, glazed in a gelée but which has been perfectly prepared in an exquisite court-bouillon, which could replace the langouste or the lobster? Roast goose or turkey? Too common! A pheasant, preferably a hen, which is more tender and delectable, roasted wild thrush, a nice leg of goat served more than pink - almost red - will win you lots of accolades. With the leg of goat, madame, absolutely no gooseberry or red currant jam! Even avoid chestnut purée, and instead serve a lovely purée of mushrooms which will give the soul of the forest to your meal. There are more simple menus: onion soup, white or black boudin, a nicely arranged platter of gourmet cold cuts, where the pork filet is alternated on the platter with poulet en gelée. Or even small escargots, andouillette grilled with apples, or a galantine of poultry. But perhaps you like adventure or the unexpected? If so, a few days before the réveillon, go to the tourism agency of the Boulevards, and sign up for the “réveillon surprise,” for 4000 francs per person. On the evening of the réveillon (Christmas or New Year’s), at 9:00 pm, you board blue or brown buses which will take you on the most amazing tour. Your bus will leave Paris by one of the Portes and then enter via another Porte; then your driver will seem to decide to head to one of the nearby towns; then en route he will veer onto another road and take you someplace completely different. Delighted and dizzily turned around, you will ask yourselves where on earth he might be taking you. Last year, the buses stopped, at about 10 p.m., some in Robinson, others in Moulin-Orgeval or in the forest of Fontainebleau, others elsewhere. And en route the happy travelers enjoyed a menu which was undoubtedly very classic, but spiced with fun: dancing the farandole, crazy running from one level to the next, and other unexpected festivities. And the wine was included in the price - so no surprise on that score. The name itself is magical, and without a doubt the most effervescent word in the French language. The word itself bursts forth like the cork from a champagne bottle. However, madame, make sure that you swirl your champagne with one of these little winged twizzle sticks which a maître d’ will place in front of you with a flourish. This “brassage” lends to the wine a foamy verve, this bubbling (let’s not speak of carbonation) which Dom Perignon spent so much effort to perfect. Before Dom Perignon, as sometimes was the case in Anjou, champagne gently bubbled like this so pleasantly. But rarely do we let it keep this lovely characteristic. Respect it, madame, with Dom Perignon -- and with good taste. of the Academie des Gastronomes.